When lay people think of existentialism, they often make associations to death and atheism. Nietzsche’s phrase “God is Dead” is interpreted to target the existence of God versus our belief. Sartre’s “Hell is Other People” suggests that we are here, in hell, on Earth. Camus’ The Plague illustrates in excruciating detail the uselessness of dogma and science in the face of even a young child’s death, rendering both medicine and religion helpless when up against the inevitable disease and decay of nature. All of these are examples of how existentialism can throw the baby out with the bathwater, the baby being spirituality, the bathwater being religion. Fortunately, I was taught early on in my existential mentoring that there are several camps of existentialism: atheistic and spiritual. Camus, Sartre, and Nietzsche would likely fall into the atheistic camp, although I believe that Nietzsche deftly straddled both worlds. I have enjoyed the writing of all three. Still, the most inspiring existential thinkers to me were the spiritual existentialists such as Heidegger, Buber, Kierkegaard, Tillich, and Becker. Heidegger immersed himself in Eastern philosophy, Buber in Judaism, while Kierkegaard, Tillich, and Becker were Christian existentialists. Having the words “Christian” and “Existential” placed even remotely close to one another seems oxymoronic to those who identify with the more stereotypical conception, and yet, I have been undoubtedly most inspired by the Christian Existentialists. I would also add William James (1902), who pondered mysticism in The Varieties of Religious Experience and so humbly concluded his work by admitting that after all of his inquiry, he still did not know what is true and what is false regarding the spiritual dimensions of human existence. Regardless of whether any of these philosophers were of spiritual sensibilities is less important to me than the central thread at the heart of existentialism that holds all of their ideas together: to some degree, they all were interested in the direct experience of the human being and how that contributes to consciousness (i.e., some form of phenomenology). These days, I have been most interested in how religious paradigms impede our capacity to access our deepest spiritual being. I am also interested in how we can learn to tap into direct experiencing in a way that is powerful enough to transcend religious paradigms. I want to note that this does not mean transcendence of the self, but quite the opposite. As we transcend the paradigm, we descend into ourselves. Strangely, just a day after I decided this blog piece would be on the above topic, my son and I decided to watch The Sound of Music. This film has been a favorite of mine since I was a young girl. However, watching the film after a long hiatus, what this film means to me has shifted. 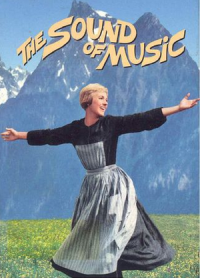 What jumped out at me most poignantly from the minute I saw Maria Von Trapp singing on that mountain in Austria was that this film is far more spiritually grounded than I’d imagined. Even more so, Maria Von Trapp was a character that embodied spiritual heresy. Maria Von Trapp? That sweet little red headed pixie with an angelic voice? A heretic? Ummmmm, absolutely: that wonderfully human pixie. This story is about many people and many issues. Most primary is the perseverance of the human spirit against all odds to align itself with what feels pure and essentially honest in the face of that which one cannot afford to lose: human dignity. I will begin at the end, pointing out that our protagonist, Maria Von Trapp, accompanies her new husband and inherited seven children across the mountains by foot to cross the Austrian border into Switzerland for asylum. During the period in which this film was set, the hegemony of the Third Reich bullied and reigned over its brother and sister nations, committing horrific acts of genocide in the name of racial cleansing. As terrible as it was, people still conformed. Captain Georg Von Trapp’s staunch refusal to report to his post with the Third Reich was an act of heroic proportions, and a rebellion against a political paradigm that targeted the Jewish cultural and religious people as their scapegoats. Seemingly, Captain Von Trapp’s reunification with song seemed to reinforce the depth of his convictions that one “must help it” when even remotely exposed to a way of thinking that was slowly eroding the humanity of his Austrian home. When Captain Von Trapp said farewell before fleeing, he said farewell by leading an audience of Austrians in a love song about their country flower, a symbol of purity and nature: Edelweiss. I now want to skip back to the beginning. I want to spend more time with “Maria,” first on the hill, then the convent, and then in her post as Governess. We begin the film with a nun on a hill, enthralled and caught wildly in the natural world. Here, it seems that Maria is most ecstatic. “The hills are alive with the sound of music” is followed by a vivid encounter of birds, brooks, and trees. The whole scene smacks brilliantly of Emersonian transcendentalism, the mountain of green in its expansiveness being the most unlimited of all cathedrals, reaching beyond what any architect could design with the intent of channeling God. What is the need? God is already here. He has built his own cathedral, and we are a part of that already, so long as we are willing to learn to step into encounter wherever we are. Throughout the movie, we see Reverend Mother approaching Maria’s struggle with the life of a nun as a sign that she may be called to something else, viewing her traits that may be viewed as difficult as strengths of character that may otherwise manifest something more meaningful in a different context. The Great Reverend Mother sees that the spiritual path is not necessarily as a nun, and that there are other ways to honor God. The Great Reverend Mother’s sense of the divine is advanced to a degree that is not often seen in mainstream religion. She is able to “think outside of the box.” Indeed, the Abbey is one vehicle, but is not the be-all, end-all. You don’t. Clouds just are what they are, and they are miraculous. Words are symbols and they bind. They can never completely define anybody or anything. This is the beauty of not being able to find the right word for such a mercurial soul. And listen to all you say? Here we have it: A woman who is a force of nature; A woman who stands against reason because she stands for something greater than reason; A woman who cannot be held down and who has the ability to question, diving beyond the explicit explanations and into the implicit questions and curiosity. This is a woman who defies the very structure that she volunteered herself for, and even hesitates to leave. She’s a darling, she’s a demon, she’s a lamb. Translation: Something about her way of being has forced me to examine the groundlessness of existence. I can barely stand all of this cognitive dissonance. She defies polarity! What? How can she be everything? It’s totally disarming! Stop it! You’re taking my security blanket away, that blanket called “Catholicism.” I’m so uncomfortable! Translation: She’s human, and God expresses himself through her in infinitely paradoxical ways. There is something so very real about having a voice, and yet it is fluid, an excellent metaphor for consciousness in the sense that it moves like a river, constantly changing, and yet is always so distinctly present. Music is certainly an enlivening expression of spirit. In the right context, it is like a prayer, but not the kind of prayer that asks for something. Rather, it is the kind of prayer that galvanizes Tesla energy into enlivened form: perhaps the highest manifestation of prayer. When the Reverend Mother asks Maria what she has learned at the Abbey, Maria says it is “to find out what is the will of God and to do it whole-heartedly.” Once again, Maria is referring to a way of being. There is a theme that rests on finding one’s true path that winds itself throughout the film, and yet what stands out even more in the above statement is the investment of heart in what we do: To engage ourselves in our entirety to what it is that we are called to. What better way to find this than through an immersion in our most ecstatic being? Argyle Enterprises, Inc. (Producers), & Wise, R. (Director). (1965). The Sound of Music [Motion picture]. USA: Twentieth Century Fox. Dickinson, E. (1924). Emily Dickinson: The complete poems. Boston, MA: Little, Brown. James, W. (1902). The varieties of religious experience: Centenary edition: A study in human nature. London, UK: Routledge. Nietzsche, F. (1967). The birth of tragedy. (W. Kaufmann, Trans.). New York, NY: Vintage Books. Schneider, K. J. (2009). Awakening to awe: Personal storied of profound transformation. Lanham, MD: Jason Aronson. Look for PART TWO on coming on Monday in THE NEW EXISTENTIALISTS.